Brand-New, Unopened, Official "Gold Series" DVD! One of the last places in the world to buy this DVD! The Gate to the Mind's Eye is the third computer animated odyssey in the "Mind's Eye" series. 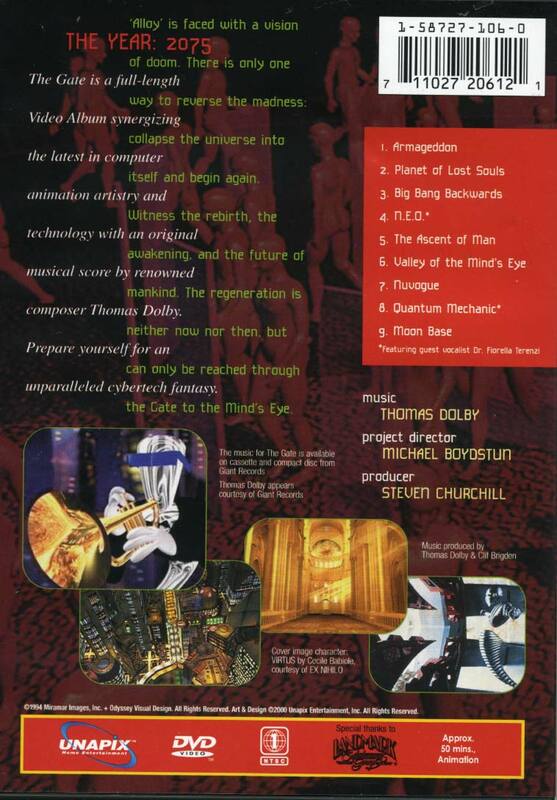 The Gate synergizes the very latest in computer animation artistry and technology with an original musical score by renowned composer Thomas Dolby, creating a very intense visual-music experience. The most phenomenal new computer animation is presented, including work from Sega, ExMachina, Boss Films, BUF, Angel Studios, Ex Nihilo, Metrolight Studios, MacGuff Ligne, Links Corporation, Rhythm & Hues, Kleiser-Walczak, RezN.8 Productions, Topix, Riff, XAOS, Lamb & Company, Santa Barbara Studios, Karl Sims and Jun Watanabe, etc. this DVD will be gone forever!